Are there meals that you make and enjoy and then forget about? Because you’re consumed by all of the other meals you want to try? 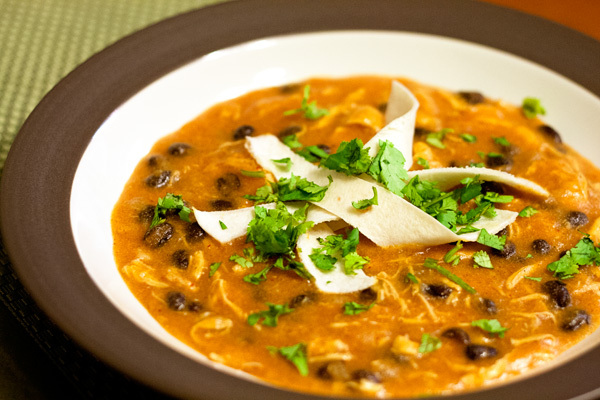 Such is the story of this chicken enchilada soup. We first made it four years ago (how is it even possible that we’ve been sharing a kitchen for four years?!) after tasting a version from the Atlantic Bread Company. So when we were craving Mexican food last week — as we often do — we decided to forgo our standard burritos for a pot of spicy soup instead. The list of ingredients is no surprise: chicken, beans, chili powder, cumin, onion, garlic, cheese. Chicken stock and masa harina (corn flour) add substance, and enchilada sauce adds flavor. Finish with a splash of hot sauce, strips of warm tortillas, and a handful of cilantro, and you have yourself a fiesta! This recipe was certainly worth resurrecting. Season chicken breasts with salt and pepper. In a skillet, cook chicken in olive oil over medium heat. Remove chicken from skillet and set aside. Add onions and garlic to the skillet; saute 3 to 5 minutes. Remove from heat and set aside. In a small bowl, whisk together masa harina and 1 cup water until well blended. Pour into a large pot set over medium heat. Add remaining 1/2 cup water, chicken broth, enchilada sauce, cheese, salt, chili powder, cumin, and hot sauce. Bring to a boil. Shred cooked chicken and add it to the pot, along with onions and garlic. Reduce heat and simmer 20 minutes. Add black beans and simmer an additional 20 minutes until thickened. Serve with strips of warm tortillas and fresh cilantro. Emily, I do that all the time with recipes! Make something really good, and then totally forget to ever make it again. It’s on to the next! I think blogging both contributes to this (need to try new things to post) and helps jog my memory about what I made before that I liked. Anyways! This look delish. Hopefully it will make it into the rotation! Oh, I want this now! This sounded so good that I made it this week end–aieeeeee—-followed to the letter but it turned out more like polenta with chicken and beans. Any thoughts as to what went wrong? ?